I am a OSU graduate in Early Childhood Development. I would like to discuss more if you are interested. I graduated in 1993. 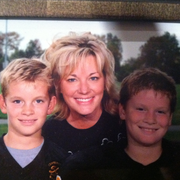 I have 2 boys 5th and 6th grade and looking for something part time while they are in school. CPR, First Aid, Communicable Disease and Child Abuse certified. I have over 200 hours in continuing education. I have worked in many childcare settings. I have worked with all ages. My experience varies from childcare settings, opening centers, nanny and a Director of a Learning Center for 12 years. Tricia doesn't have any reviews yet.